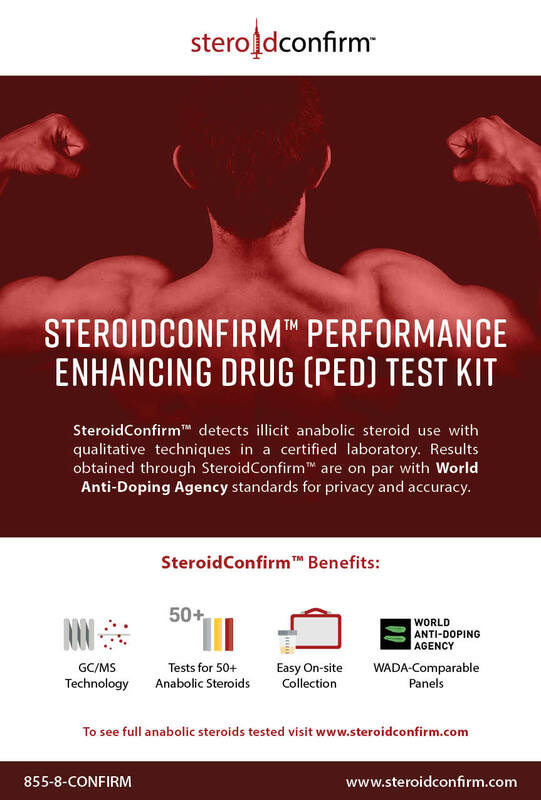 SteroidConfirm™, the convenient and affordable anabolic steroids abuse test utilizes the most sensitive and sophisticated technology available, to provide you with highly accurate results. It enables you to test individuals who are suspected of abusing steroids. Simply mail a urine sample to our laboratory using the prepaid overnight shipping envelope. Simply mail a urine specimen to our laboratory using the prepaid express shipping label. You have the option to perform a confidential test (no personal information is required) or a test with a Chain of Custody*. The window of detection for steroids varies drastically. At the low end of the spectrum the window is only 2-3 days. On the high end, a couple of months. For an estimate, you can refer to the Steroid Half-Lives file below. Steroids, similar to THC, are not water soluble. With testosterone, because it occurs naturally you will almost always detect the hormone. It is necessary to test for testosterone because the body adjusts natural production of the hormone when it is introduced to synthetic steroids, i.e. the levels of testosterone are usually off kilter. Traditionally, the abuse of anabolic steroids has been linked to athletes who want to improve their athletic performance. While this still remains to be the case, steroid abuse has become prevalent among individuals, both men and more increasingly women, to increase muscle size and reduce body fat. Individuals of various ages abuse steroids, but it is the abuse among high school students which is a particular problem.